Engineering, selection, procurement and commissioning of instrumentation and control system in accordance with client specifications meeting all necessary national and international regulations and standards. Liaise with instrument vendors, clients, construction team, other engineering disciplines and relevant regulatory bodies to clear all technical issues during engineering and construction. Prepare key engineering deliverables including execution plan and schedules, instrument specifications, datasheets, requisitions, technical bid evaluations, close out reports etc. Supervise and support design team in 3D model review and preparing key design deliverables including MTO, cable and tube schedules, loop wiring drawings, instrument index, layout drawings etc. Ensure health, safety and environment requirements are met. Identify areas of improvement and provide the necessary inputs to management. Supervise, support and mentor other junior engineers in the team as required. Design and development of measurement and automation Systems for remote operation of Solid Propellant Mixing and Casting Facilities used for production 200 Tonne Solid Rocket for GSLV Mark III, heavy launch vehicle of ISRO. Procurement of CCTV system including those for hazardous area monitoring, site erection, commissioning and testing. Design, procurement, erection, commissioning and upkeep of plant networking for process control, plant safety system, fire and gas system and plant telecommunication. Development of Model Predictive Controllers for Unmanned Aerial Vehicles (UAV) in collaboration with Defence Science Organization (DSO) Labs, Singapore. Developed mathematical models for DSO UAVs from first principles suitable for simulation in MATLAB. Developed navigation, guidance and control system (NGCS) for the UAV based on Model Predictive Controllers (MPC). The MPC was designed to optimise various parameters of the UAV independently or in combination such as fuel and thrust requirements, time of flight, turning radius during complex maneuvers. The Mariner Field is located on the East Shetland Platform of the UK North Sea, approximately 150 kilometers east of the Shetland Isles. Statoil U.K is developing this heavy oil field using a combination of offshore platform for heavy oil processing, Floating Storage Unit (FSU) for diluent and produced fluid storage and jack-up drilling rig. Platform topsides is engineered by CB&I and constructed by DSME, Korea. Package engineer for control & choke valves for the entire platform. 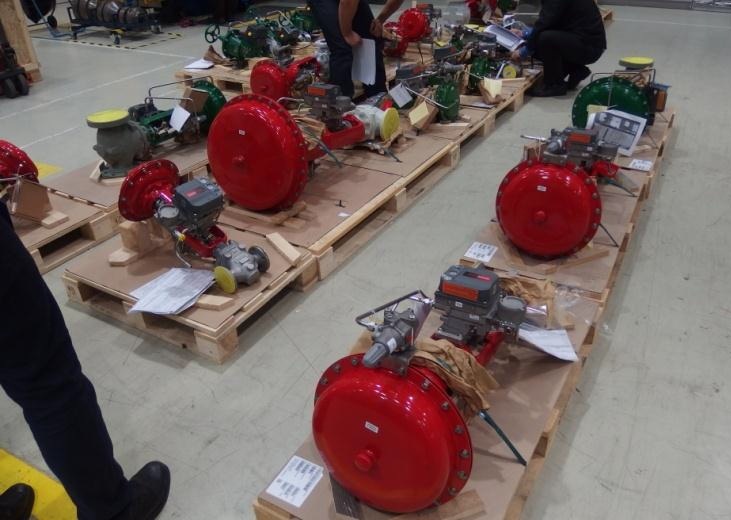 Procured over 130 control valves and 25 choke valves in from suppliers including Fisher, Mokveld & CCI as per applicable international standards and Statoil Technical Requirements. This includes valves in exotic materials including duplex, super duplex, titanium and 6Mo. Prepared detailed specifications, datasheets and material requisition documents for control & choke valves. Worked as single point of contact for all necessary technical clarifications during bid phase, verification of control valve sizing calculations, prepared technical bid evaluation documents and final purchase documents for control & choke valves. Participated in the detailed dynamic simulation studies for the complete Mariner process plant. Ensured the dynamic performance of control valves match the overall plant requirement under all conditions including normal operations, process start-up, upset and the variations in well fluids during course of life cycle. Liaise with the control and choke valve suppliers to clear all technical issues after purchase order. Review of vendor documents including datasheets, sizing calculations, GA drawings, test plans etc. Participate in meetings at vendor facilities post PO for kick-off, pre-inspection, FAT etc. Supported procurement of safety relief valves and verification of safety relief valve sizing calculations submitted by the supplier. Reviewed specifications, datasheets, technical bid evaluation documents and final purchase order documents for safety valves. Instrumentation and Control Systems engineer for the entire FPSO topside. Prepared the overall DCS architecture, interconnection between the DCS remote cabinets, package equipment including gas turbine generators, gas compressors, sub-sea equipment, ship navigation and marine systems. The FPSO Cidade de Mangaratiba MV24 will be deployed in the BM-S-11 block (Cernambi South) in the giant "pre-salt" region of the Santos Basin with its water depth of 2,300m. MODEC will convert the VLCC Sunrise J into the FPSO. MODEC is responsible for the engineering, procurement, construction, mobilization, and operation of the FPSO, including topsides processing equipment as well as hull and marine systems. SOFEC will design and provide the spread mooring. CB&I is the engineering subcontractor to MODEC and is responsible for the entire topside. Instrumentation and Control Systems engineer for the entire FPSO topsides. Engineering and design of instrumentation & control components including control & choke valves, shutdown valves, safety relief valves, transmitters, analyzers etc. for Process Control System (PCS) and Safety Instrument System (SIS) as per applicable codes and standards including API, ASME, ANSI, ABS, ISO etc. Was involved in engineering and design of the necessary interfaces, instrument & electrical cabling, instrument tubing, cable and tube tray layouts, instrument and panel erection drawings, instrument and IO index etc., essential for the proposed instrumentation and control systems. Engineering and design of instrumentation interfaces to vendors supplied packages including gas turbine generators, main and reinjection compressors, flow metering systems, produced water treatment system, chemical injection packages etc. Detailed design of Fire & Gas System (F&G). Performed review of F&G sensor positions recommended by Bureau Veritas Brasil for constructability and maintainability. Subsequently did detailed engineering and design for various F&G sensor-transmitter systems such as flame detectors, CO2 detectors, H2S detectors, open path gas detectors, gas analyzers etc., and their instrumentation interfaces to PCS and SIS etc. Design and review of topside instrument interfaces to sub-sea system including Master Control Systems (MCS), Hydraulic Power Units (HPU), Subsea Video Surveillance, Self-Standing Hybrid Riser Control System, Precision Riser Positioning Systems including hydro-acoustic and GPS based positioning systems etc. Coordinated and reviewed instrument interfaces between FPSO topside fabricators in China, Thailand, Indonesia, ship conversion yard COSCO, China and final integration yard at Brasfels, Brazil. Instrumentation system modularization and reviewing inter-module interfaces to enable quick fabrication at multiple locations and final integration at BrasFELS. The Solid Propellant Plant (SPP) is set up at Satish Dhawan Space Centre, Sriharikota for producing S-200 solid booster segments (200 Tonne solid first stage) of Geosynchronous Satellite Launch Vehicle - Mark III (GSLV-MKIII). The plant has state of art technology in propellant mixing & casting facilities with PLC based controls and continuous casting using transfer car /master hopper concept. The plant has best in class safety features with automation and remote operation of most of the facilities. Instrumentation & Control Systems project engineer responsible for Instrument and F&G cabling, cable trays design, preparation & verification of IO list and Instrument Index, loop wiring drawings, instrument plot plans, F&G plot plans etc. As Smart Plant Administrator supported engineering and design team for SPI related activities. Instrument engineer tasked with detailed review of the sizing calculations and selection of critical control valves identified in FEED. There were over twenty five such critical control valves. Independent sizing calculations for the valves in accordance with ISA 75.01 and IEC 60534-2-1, and noise predictions based on the basis of IEC 60534-8-3 and IEC 60534-8-4. Package Engineer for Control and Choke Valves. Worked through initial procurement of control valves to dynamic plant simulation studies (to ensure process stability) and finally engineering support to construction yard. Instrumentation and Control Systems engineer responsible for the mixing and casting facilities at SPP. Engineering of measuring instruments, control and shutdown valves, PLC system components etc for mixing and casting facilities. Procurement of these systems from vendors, Factory Acceptance Testing (FAT), site erection, commissioning and final integrated system testing. Instrument transmitters were procured from Rosemount, weighing systems from Sartorius, control valves from Fisher etc. SPP control system is based on Siemens S7-400H hot standby PLC-System for individual mixing and casting facilities. During this project worked on Siemens STEP-7 PLC programming and GE-Fanuc SCADA system. Individual PLCs and other plant systems including Fire and Gas systems, IP telephones, management information system are interconnected using plant network on a optic fibre backbone. Involved in the procurement, FAT, site erection, commissioning and final integrated system testing of the entire plant network for SPP. Worked on CISCO and Entransys level 2 and 3 switches. Thorough understanding of PC operating systems including Microsoft Windows OS family, Linux. Basic shell scripting in Linux and Windows. Engineering software for design and review for key engineering deliverables. Instrumentation & Control Systems engineering, design, construction and operations software. Automating repeated tasks and activities that arise during instrumentation and control systems engineering and design.